The TURBO libraries (toolkit) have been designed to simulate the design and calculate the performance of systems based on gas turbines, such as turbojets, turbofans, turboprops or turbine generators in electrical power generation applications. It also allows the study of transients and advanced calculations. Its complete catalogue of components allows the creation and study of new and innovative configurations of these systems, such as the contra-rotating open rotor. This has ensured its place among the main participants of the European aeronautical industry. Design point: geometry and turbo machinery are optimized to meet performance objectives. Multipoint design: design the system at the same time for different points. Steady state prediction: design is frozen and performances are evaluated throughout the flight envelope and power settings. Transient predictions: the engine is monitored and the control system is optimized. Data analysis: the engine model is modified to match test engine data. Optimization: calculations of optimal points in design and off-design studies. 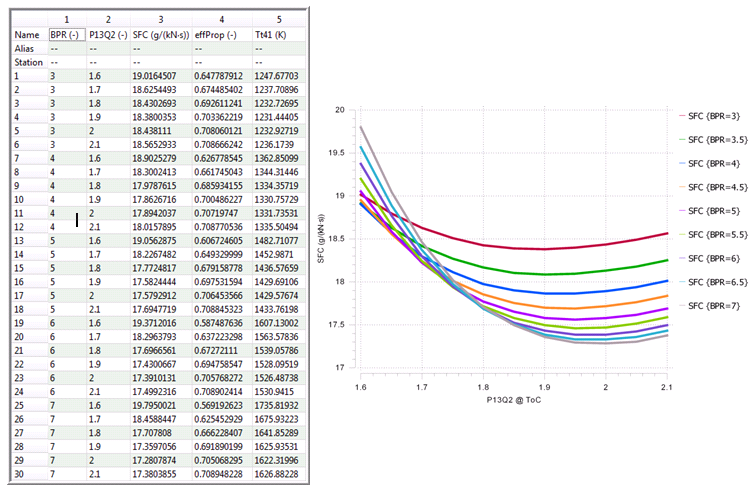 Graphical modelisation: Using drag & drop methodology, the user can quickly create the thermal diagram to be analysed. 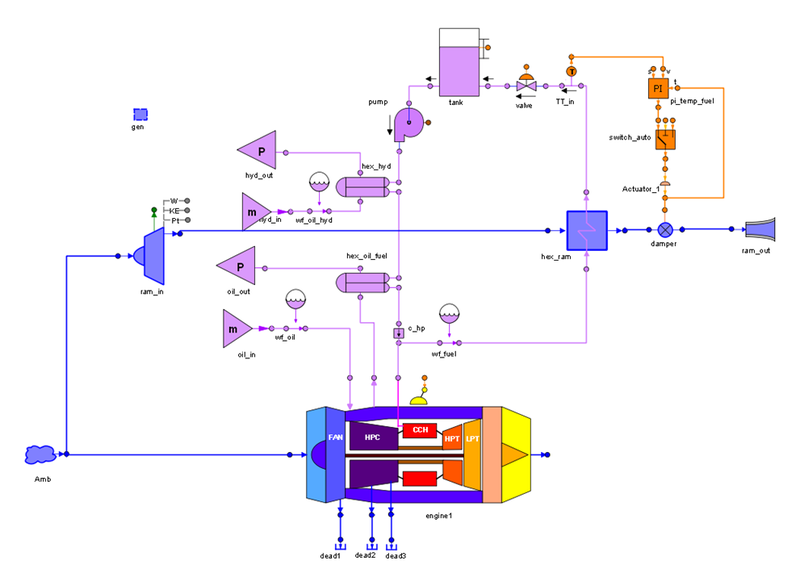 The TURBO library provides a wealth of components to be inserted in a model. Component operating modes: The library components include different operating modes (pressure loss models, bleeds extraction and efficiency computation modes, …) for each component. Performance maps: BETA and MFT maps are used by turbo-machinery components to perform real simulations. User maps can be easily included in the models. 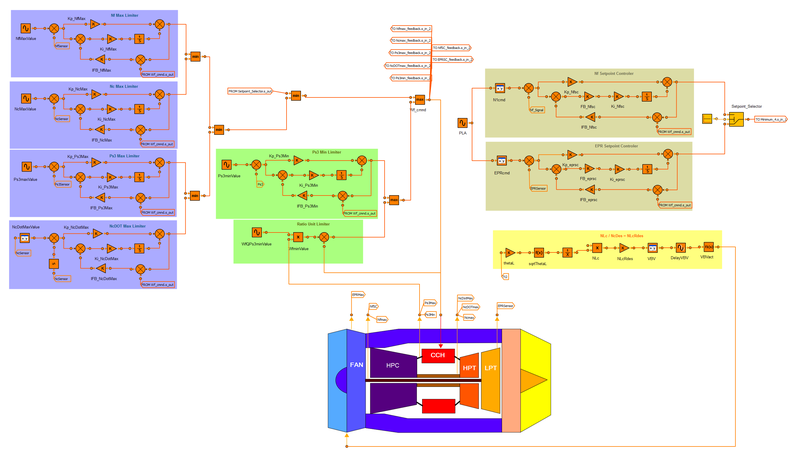 Fuels database: Several fuel models are included in the library. The database can be easily extended with user’s fluid models. Library extension and customization: Inheritance and aggregation make it easy for the user to design new components and modify the existing ones. Fluid Model Generator: This tool generates fluid model thermodynamical tables in .xml format for user-specified fuels. This is achieved by utilizing the NASA Chemical Equilibrium Application (CEA) application. The PROOSIS monitor allows the performance maps of the various components to be graphically displayed. 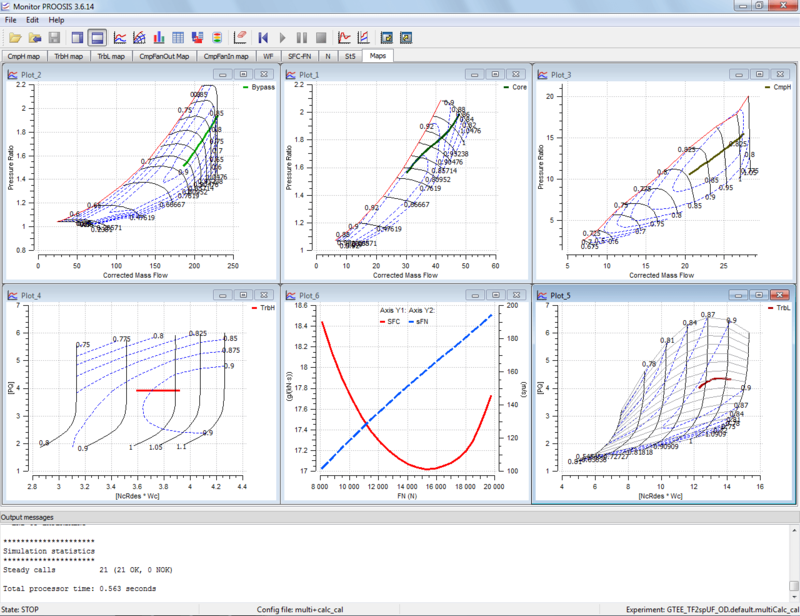 The flexibility provided by PROOSIS in its experiments allows multiple types of simulation to be created. The image shows the results of the parametric design of a turbofan: study of the influence of the bypass ratio and the pressure ratio of the fan. The possibility of connecting with other aeronautical libraries allows different aircraft systems and subsystems to be simulated. The CONTROL library, included in the PROOSIS installation, provides all the elements required for the treatment of signals in analogue and digital systems. The connection with TURBO provides the possibility of performing complete studies of both the motor and its control system. The ELECTRIC_SYSTEMS library provides the elements required for the joint simulation of the motor with the electrical system (generation, distribution and protection devices), both for alternating current with constant or variable frequency and for DC current. 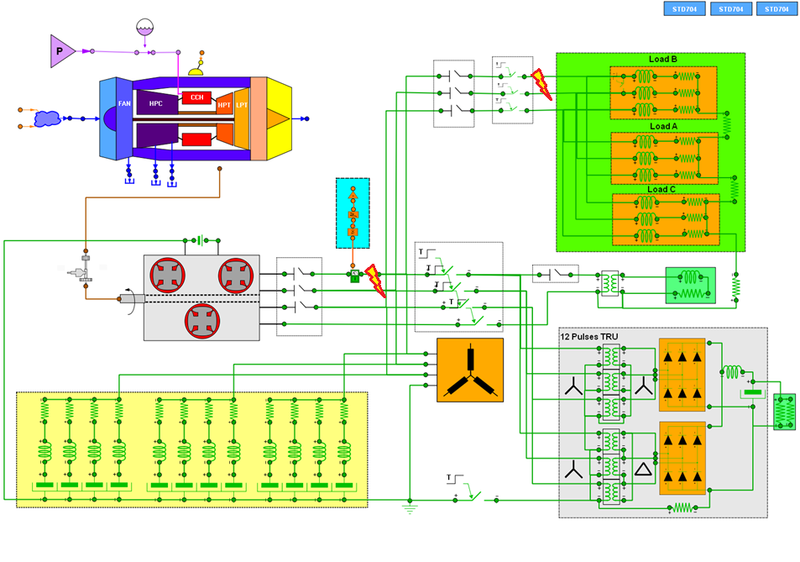 The ECS library provides the elements required for the joint simulation of the motor and the Environmental Control System (ECS). 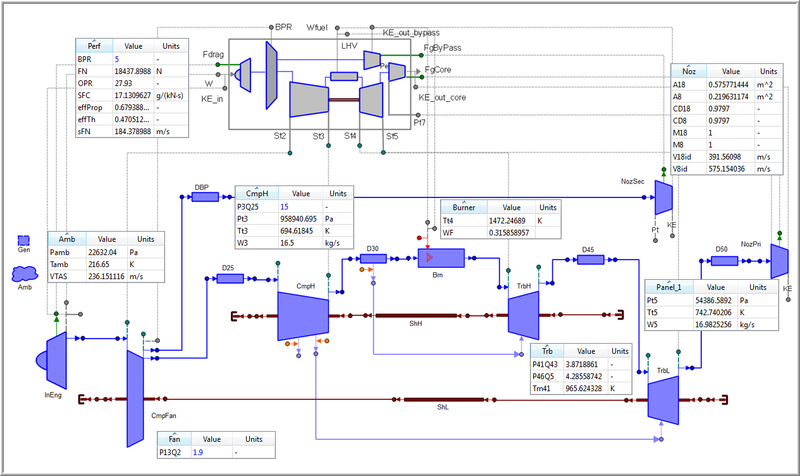 The PIPELIQ library provides the elements required for the joint simulation of the motor and the fuel and oil lubrication systems, which are key to studying Thermal Management. The ORC library provides the necessary elements of the ORC thermodynamic cycle for the joint simulation of the motor and the ORC cycle, which is relevant for more efficient engines, that have a lower consumption and are less polluting. The components of the ORC library may be easily connected with the TURBO thermodynamic models. 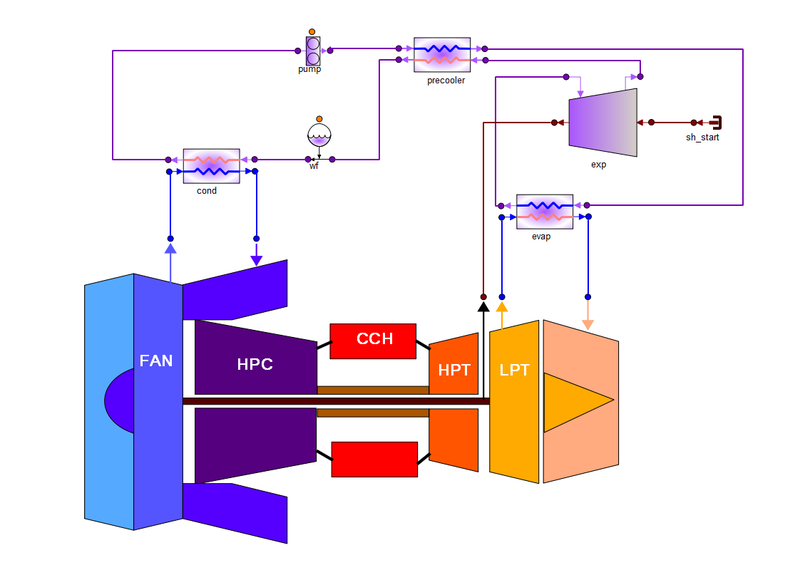 Below is an example of a turbofan with a heat exchanger using a simple ORC system.